I have a beloved simple black shift dress I bought years ago that absolutely can’t be worn anymore, and I recently bought 4 yards of black ponte to replace it and make a couple other garments. Part of the ponte went toward my color blocked dress, and I made a dress not at all like the dress I’m supposed to replace with the rest. This dress is riddled with the results of poor choices, but I actually do like the finished product. 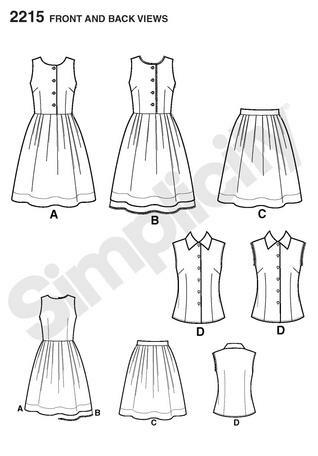 I used the bodice of Simplicity 1802 and the skirt of Simplicity 1654, which is just a gored circle skirt. My biggest mistake was making this bodice with ponte – that neckline is bulky, despite careful grading and pressing! Also, and this is embarrassing, I didn’t realize this dress had a low v-back until I constructed the bodice. I don’t know how that important detail slipped by, but it foiled my plans at having a nice winter work dress with sleeves. In the end the sleeves looked frumpy anyway so I cut the armscye in a bit to make the dress sleeveless, just guessing where seamline should be. 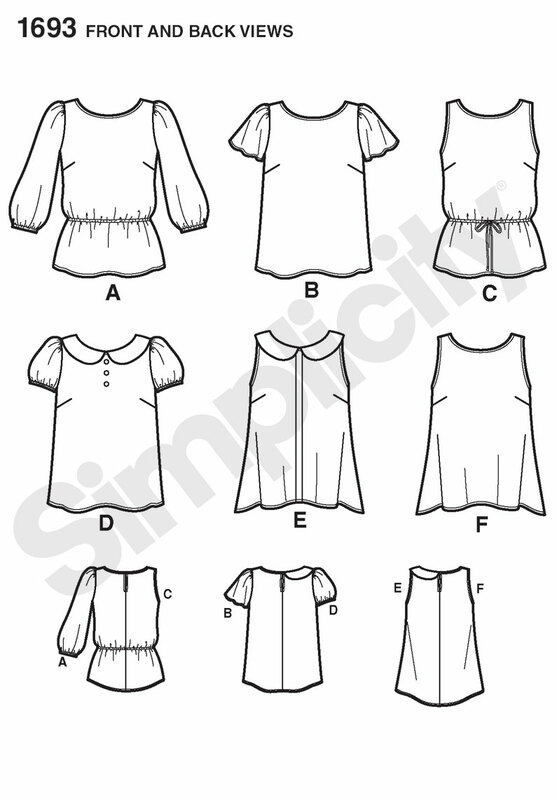 Not a good method, obviously, a well-designed garment doesn’t look like this around the arms! It doesn’t matter, though, because it will always be worn like this with that low v in the back! So much for highlighting that seaming! This dress has been finished for about a month, but for some reason I’ve been having trouble writing this post. Maybe it’s because I’m just not all that excited about the dress. I actually was excited when planning this project. I ordered some double knits from Fabric Mart during a 50% off sale, with the idea that I need a few basic work dresses that will withstand my bike commute. I didn’t like the actual color of the blue or purple fabrics when they arrived, but seeing the three fabrics stacked together inspired me to combine them, using Simplicity 1665, a design I was very much drawn to. I just don’t think it’s that flattering in real life. The yoke and straps don’t look all that great, and there is absolutely no bust shaping. It’s not a bad dress, but it was definitely disappointing. It is a very serviceable work dress, though, and I do like it more paired with a cardigan. I do own more than one pair of shoes… these are just my favorites! So, there you go. It’s not a great dress, but it’s not a fail either. Meh. Thanks for all the encouraging comments on my Vogue dress! I’m itching to finish it, but today is my personal deadline for starting that gown. Just three weekends left! Finally, photos are taken! I made this dress on a whim the weekend before last to wear to a cocktail party for work the following Wednesday. It had been quite some time since I made a dress, and everything was going pretty well until suddenly it wasn’t. I was up late Tuesday night scrambling to finish, but the dress was completed just in time and I’m pretty happy with it. 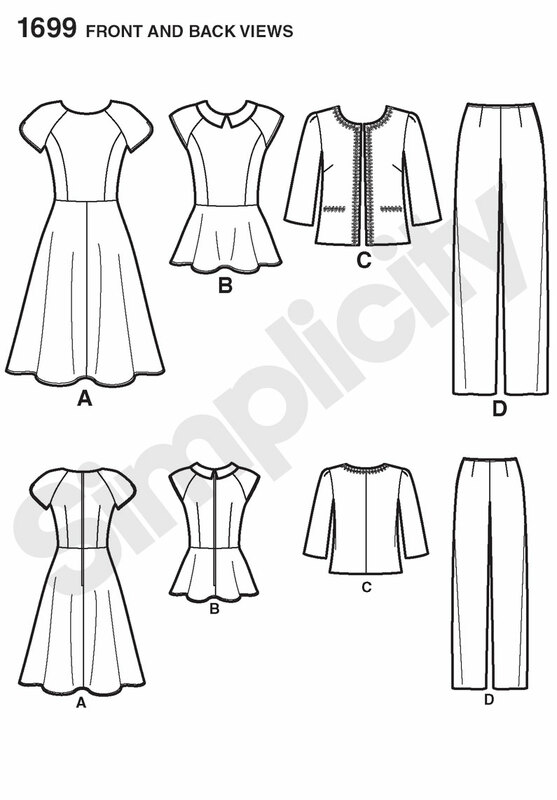 I used Simplicity 1610, which is one of the new summer patterns, and I highly recommend it! 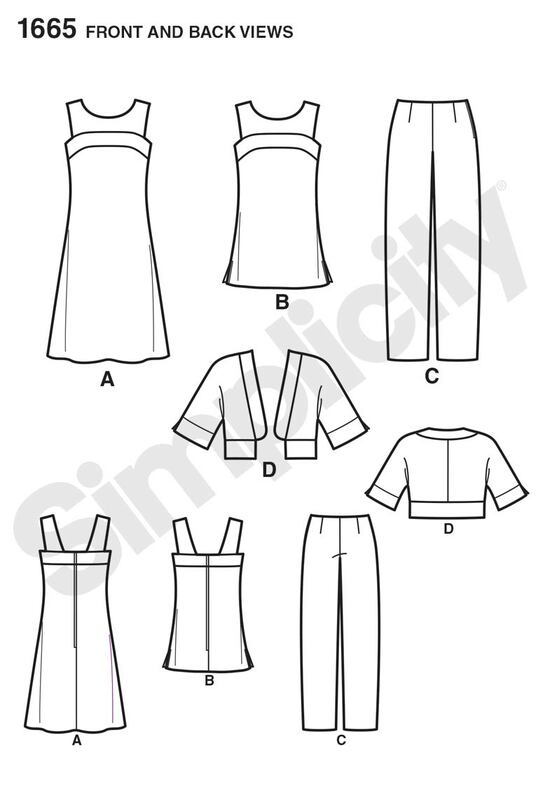 I chose the pattern because of the basic design, the sleeves, and, above all, the pockets. I’ve worked enough functions, though not quite such fancy ones, in past jobs to know that I want to have a place to stash my badge, phone, keys, and so on. 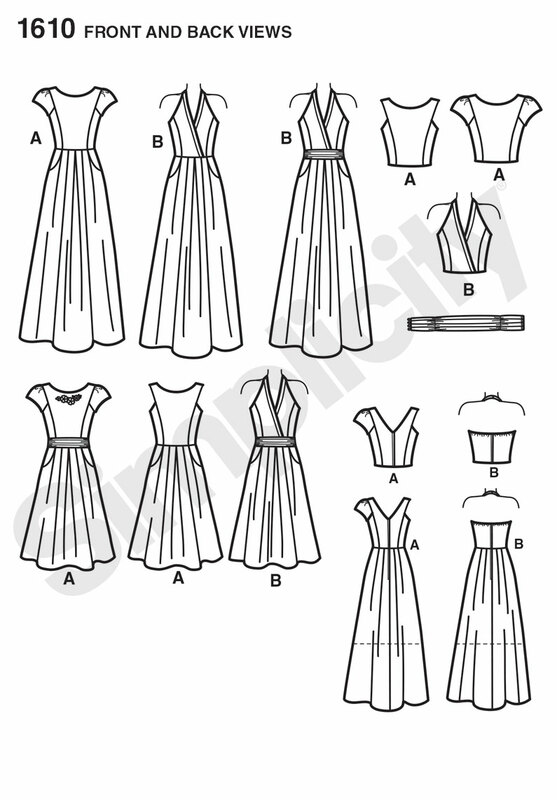 The dress was very straightforward to put together, and the troubles I had weren’t the fault of the pattern at all. I cut a 10 at the bust and graded to a 12 at the waist, which is normal for me, with no other alterations except that I sewed the back seam with a 3/8″ SA because I was afraid of it being too small. I usually construct dresses so that the side seams are the last to be sewn in order to adjust fit, but since I’ve never set in sleeves with a pivot point like this I didn’t want a bunch of dress hanging down on that step. Next time I’ll sew the regular seam allowance, as this dress is a little too big, but that actually turned out to be a good thing because I can just slip it over my head without a zipper. It’s also super comfortable, and since staff kind of blends into the background at these events, I don’t really care that there’s a bit too much ease. So, it’s a great dress, and I’m sure I’ll wear it to functions like this all the time. That said, I’m going to try to never, ever sew anything in a satin again. The fabric didn’t look all that shiny in the store next to the other JoAnn satins, but the more I sewed it the shinier it looked and the more I noticed that it shows every little wrinkle, flaw, stitch, and even the pinked edges of the wispy acetate lining that I used as a facing. To make matters worse, even though the bolt said it was 40% cotton, this fabric pressed like 100% polyester. I felt more and more trepidation about the zipper insertion, and as suspected it was a total disaster. I ended up just trying to squeeze into it without a zipper, and thanks to that 3/8″ SA I could. Phew. Even though staff blends in, I didn’t want my dress to look so totally homemade among the attendees’ designer dresses! I had forgotten how much fun it is to make dresses, but I also forgot how much I dislike sewing under pressure. I’m not one of those people who can whip up a garment in a few hours, and I like to take my time, go slow, and finish things nicely. There will be more of these parties and other events through the year, and I’m looking forward to making a few pretty dresses that are actually well-made! Hooray for a finished item that definitely works! I’ve been perfecting a slim pants pattern, and I needed to renew my enthusiasm with a quick and easy project almost certain to turn out well. I used Simplicity 1693, and it turned out beautifully with no fitting issues at all, not that the fit is super important for this style. The collar turned out nicely and the back opening is a pretty detail, but it’s totally unnecessary because the top goes over my head easily. 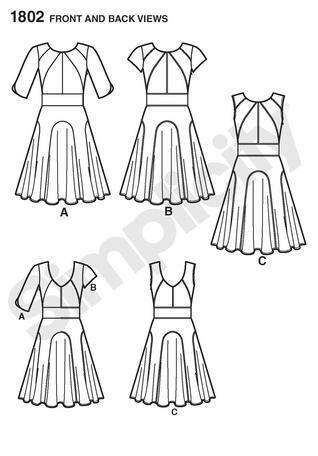 My only disappointment with the pattern is that it doesn’t include guides to cut bias to the appropriate length for the neck and arm holes, instead instructing sewists to use purchased bias tape. 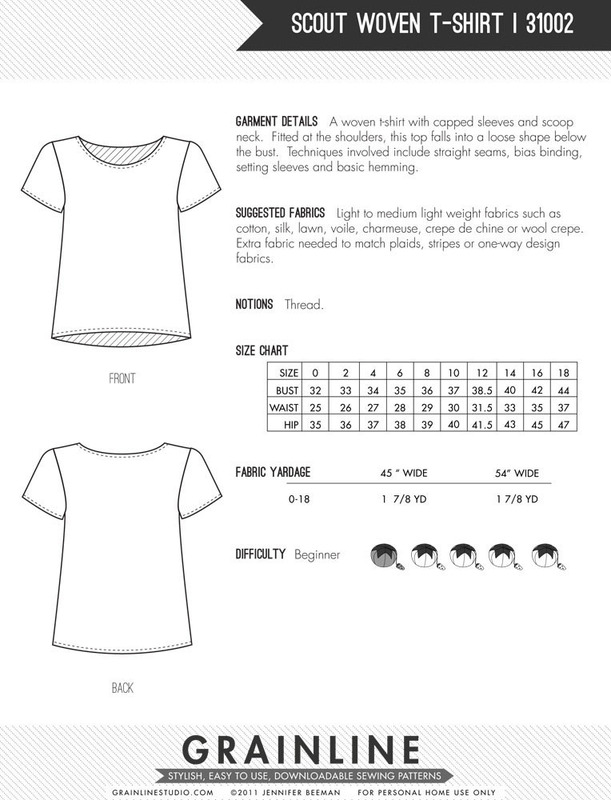 All other Simplicity patterns I’ve used have included a bias facing piece, and though I know I can figure out the length and cut my own bias, it’s an extra step that I got used to not doing. I do appreciate that Simplicity tends to favor a bias finish instead of facing either way, though, especially since this is a good pattern for beginners. When I started sewing it was all facings all the time, and ugh, I was disgusted that facings were the method for finishing homemade clothes instead of the clean RTW finish. Thank goodness for the sewing blogs that soon introduced me to bias tape! The fabric is a rayon challis purchased around New Year’s for $2/yd during a Fabric Mart sale. It’s a beautiful fabric – easy to sew and press, lovely to wear, perfect drape. The only thing is that it’s a little too bright and wild for me. I knew that before buying it, but it was such a good price! I figured I could use it to test out a new pattern at least, and at best it would help me feel a bit more comfortable in bigger, brighter prints. We’ll see how much it gets worn, but at least it’s a bit more toned down under a cardigan! Have you ever bought a piece fabric you knew didn’t match your personality or style because it was good quality and a good price? Did you end up wearing the resulting garment much? There’s a lot of discussion out there about “cake” and “frosting” clothes, with many people saying they sew way too much frosting. I’ve always been the opposite, and sew way too much cake. I know that sounds like a good thing, and I do get a lot of wear out of the clothes I make, but sometimes I wish I were inclined to make pretty, flowery dresses too! All cake and no frosting = boring. For the last few years I have worked in a business casual office in New England, and wore mostly skirts and dresses with cardigans. Does it sound like I looked like a librarian? Because I actually was one, but unfortunately wasn’t really all that cute and retro. Then we moved back home to California a few months ago (yay!) and I’m working from home, and I have nothing to wear. I still love dresses, but is it worth it to wear out tights while just at home? Is that an ascetic question? Regardless, it’s time for pants, pretty tops, comfy sweaters, and flats. Which really means, besides the pants part, it’s time to sew frosting! I envision a closet full of pretty, relaxed blouses and camisoles, and thanks to a huge Fabric Mart sale earlier this year, this is going to be a reality! I made this, oh, two years ago? I loved the fabric and it turned out well, but it had a twisted collar that looked terrible under a sweater, so I never actually wore it. Two minutes with the seam ripper, and I have exactly the sort of top that I’ve been coveting! I want to try these new patterns as well. Peplums aren’t out yet, are they? *i guess blog rules say your pictures should be the same width and fill the entire width of the column. sorry. not yet. maybe someday.